Hall of Fame broadcaster Vin Scully joined Red Barber in the booth in 1950, taking over the head reins when Barber left in 1953. 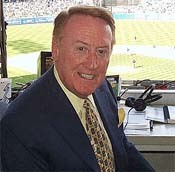 Thus, at age 25, Scully became the youngest person to ever broadcast a World Series. He remains the voice of the Dodgers--his 55 year tenure the longest in MLB history.